When it comes to your kids’ health, physical activity is an essential aspect of it. However, it’s not always easy to get your children moving, when all they want is to watch TV or play a video game. That’s why it’s important for you, as a parent, to be very creative. Here are five ways to get your kids moving and have fun while doing it. Finding a good reason for them to be outside is a great start. 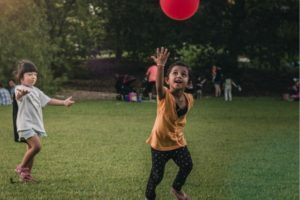 Being outside inevitably leads to physical activity, and the kids usually don’t even notice it. For example, if you get your child a dog they have to walk two or three times a day, they will spend more time in the fresh air, all the while walking and running with their pet. Buying them a ball or a Frisbee will give them something to do in your back yard, while trips to the local swimming pool or the beach will probably make your children happy to be active. Buy them a fashionable raincoat, so that they have the motivation to get out even when it’s raining. Also, sledges and skis will have them enjoy the great outdoors in the winter. If your kids perceive their exercise regime as something obligatory, they may not enjoy it that much. However, if you present the exercises through various activities, it might just work. For example, playing tag or hide and seek are great activities to get them running, while not even being aware they’re doing exercise. Furthermore, biking around the local park or hiking somewhere outside the city could be a fun and active way to spend an afternoon or a whole day with you children. It will have them on the move and allow you to further bond with them. Kids who resist doing exercise sometimes do it because they’re bored. One way to avoid that is to sign them up for a team sport of their choice. Volleyball, football, basketball, water polo or even curling might do the trick. This way your kid gets much-needed exercise, plus a chance to socialize with other kids their age. Moreover, they will be less likely to avoid practice when they know their team is counting on them. If your child thinks football or biking are dull and unappealing, try offering activities that they’ll see as cool. For example, roller skating could be more interesting to them than running. Taking dancing classes could also be a lot of fun, especially the modern types, like hip-hop or Zumba. And if you get them one of the cool looking cruiser skateboards, you get to be their hero and they will enjoy being physically active. Mind you, if you do get a skateboard, make sure you get the right protective gear along with it, just to be on the safe side. The same goes for snowboards, if you live somewhere where there’s a lot of snow. Doing exercise and being active along with your kids will set them a great example. When they see you doing physical activity and have fun along the way, they might join you with joy and eagerness. If you take long walks as a family, or take your kids to a picnic in the countryside, with pre-planned activities, they won’t even see it as exercise, but rather as quality time with you and their siblings. In addition, if they have any matches, games or presentations, always try being there to cheer for them and show them how proud you are of their efforts and success. This will give them additional motivation to continue practicing. Getting your kids to be active doesn’t have to be difficult, especially if you follow the tips from this article. And, as a bonus, if you get yourself moving along with your kids, you’ll do yourself and your whole family a great favor. About the author: Luke is a fitness and health blogger at Ripped.me and a great fan of the gym and a healthy diet. He follows the trends in fitness, gym and healthy life and loves to share his knowledge through useful and informative articles. Find him on Facebook or Twitter.